In your living room, out of all your furniture, the sofa is the main focus in your room and above all else you want it to look good and be comfy. 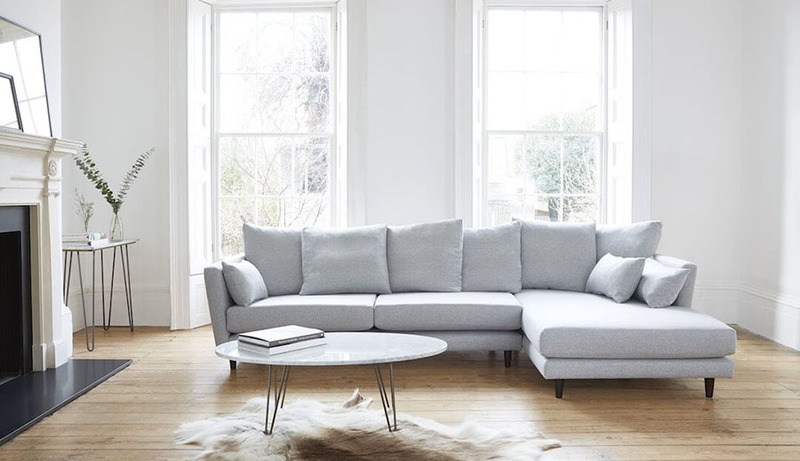 Your sofa is an investment so you want to spend time researching the best options for you, from the size of it, how comfortable it is and what suits your style and lifestyle best. I’ve spoken about our sofa before, it’s very simple in design but not that relaxing to sit on with all the family because it’s not big enough! I know when we do go to change it, I will want to consider all the details, making sure it’s perfect for us. I’ve teamed up with Darlings of Chelsea where I am going to pick four of my favourite sofas from their collection. You can customise your own sofa by picking your own fabric from a large range and some sofas are adjustable to fit your dimensions. So if you see a particular style you like you can adjust it to how you want it to look: fabric or leather, 3-seater or 2-seater. 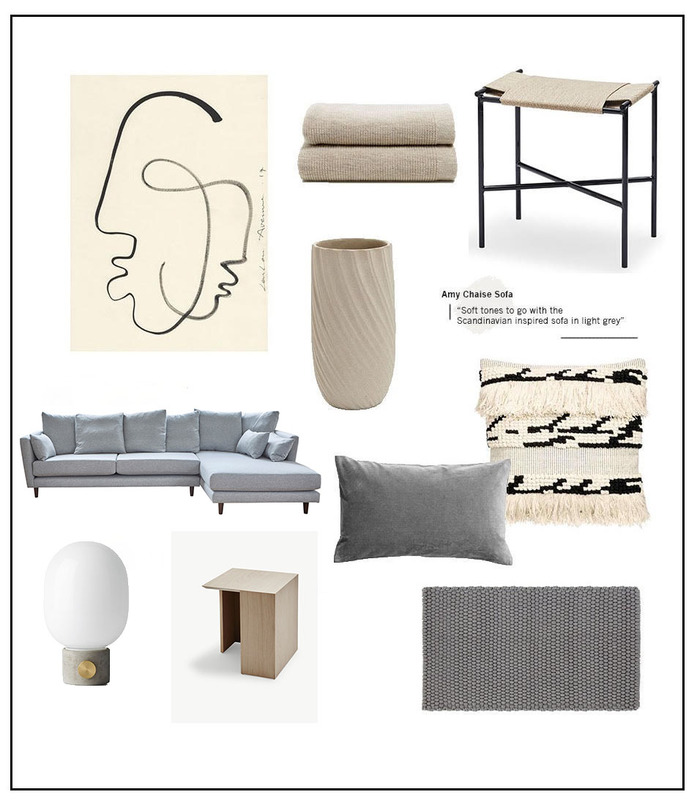 Along with my picks, I have picked a handful of accessories from rugs to lights to bring together the overall look. I would quite happily have each style in my home and you will be surprised to see something in a blue! For our sofa, I think what is lacking is that area where you can stretch your legs out and relax whilst watching TV. That’s why this sofa shouts out to me, I like the soft tone of the grey and I think it would work in most rooms. 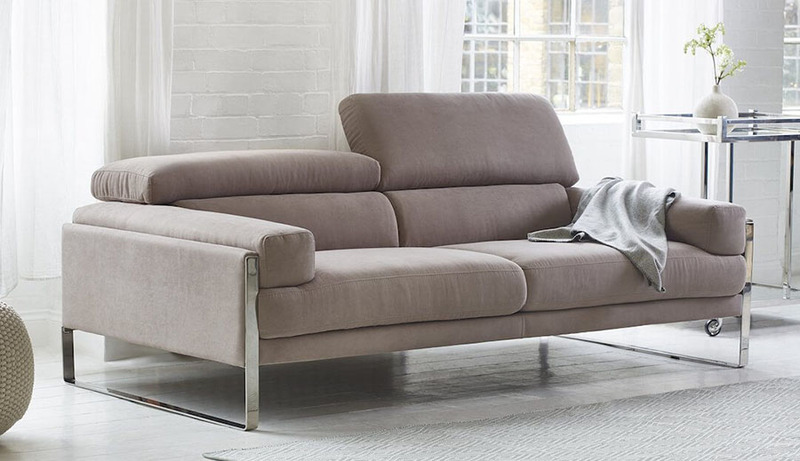 The Amy Chaise sofa is modern with a hardwood frame, you can decide on metal or beech wooden legs as well as a range of fabrics and colours to suit your own style. For the Scandinavian inspired sofa, I have chosen a soft tonal palette of grey and natural beige to complement the light grey in the sofa. 1. LouLou Avenue from The Poster Club – Currently I love strong graphic prints, they work really well in most rooms. 2. Zara Home ribbed knitted blanket – Don’t you just love the colour combination of grey and soft beige, I know that I do. The texture of the blanket draped over the sofa will create the perfect textures. 3. Skagerak Vent Stool – ‘Vent’ in Danish means wait and I love the name of the stool. Its purpose is a stool but I like when products can be used in two different ways. You could keep a stack of books on it or even a plant pot. 4. Raised design wavy ribbed vase – A vase in similar shades tie in the overall look. 5. Textured Weave cushion matched with a Grey Velvet Cushion – Because what sofa doesn’t need a bunch of gorgeous cushions. 6. Darlings of Chelsea Rope Graphite Rug – A big rug will tie everything together. I went for something in a darker grey so it will pop against the lighter grey and with some texture in the rug it will give a good mix up. 7. Skagerak Building Table – Breaking up the grey some lighter wood furniture and it’s a good idea to have something close to your sofa for drinks and within reaching distance. 8. Menu JWDA concrete light – Lighting is key in any room and I am a strong believer that you can never have too many lights. This concrete base works great. 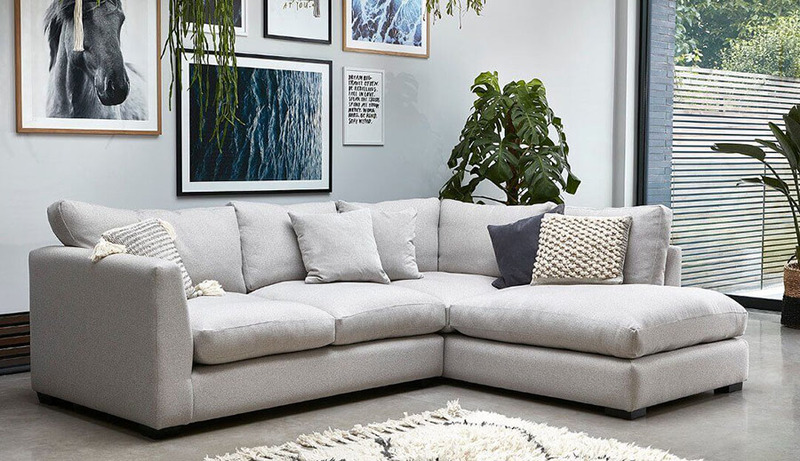 For me, it’s about style but for my husband, it’s all about comfort and I know he would love the Rocco because you can recline the sofa and have a bigger slouch on it with adjustable headrests. 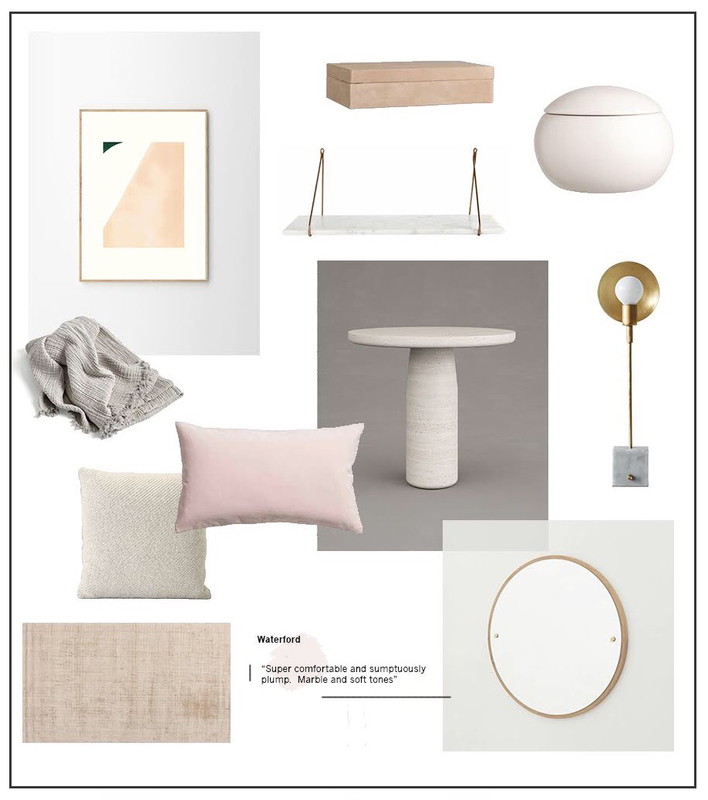 Its pink in shade but it’s a very soft pink and I think the accessories I have picked would work really well with the sofa. Instead of going for soft furnishings I have gone for dark graphic ones, which I believe, will make the sofa stand out even more. What do you think? 1. LouLou Avenue Full Moon Print – Strong graphic print will look great against the dusty pink. 2. Miró Miró Round Mirror from Friends & Founders – A mirror works great in a room because it can make a room look bigger. 3. Friends & Founders Knockout Side Table – Side tables beside your sofa are great for resting your coffee or tea on. 4. H&M Metal Vase – Vases are the perfect accessory you can use them like sculpture pieces or fill them with flowers. 5. 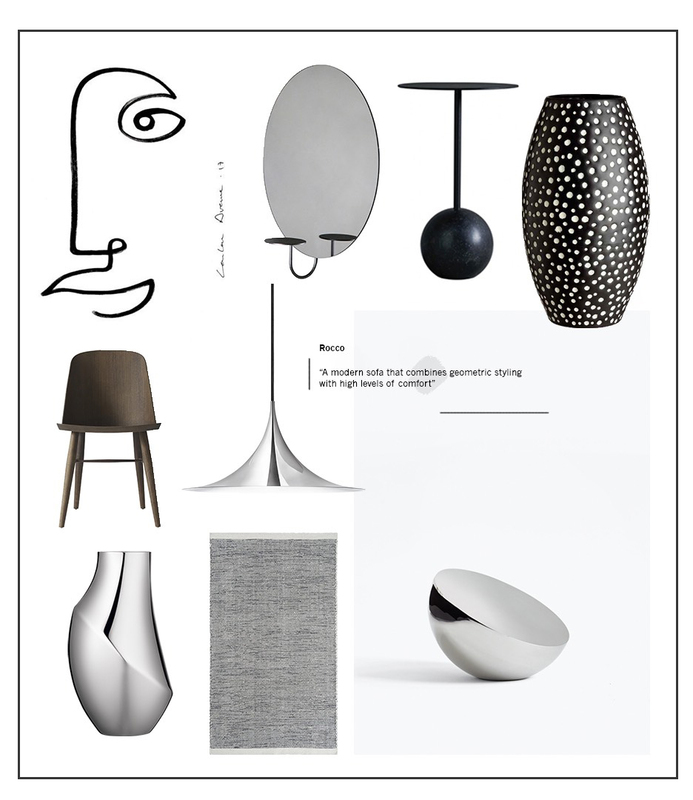 New Works Aura Mirror – A cluster of the H&M vase and Georg Jensen vase. 7. Darlings of Chelsea Asko Mixed Rug – I’ve got this rug. I get fed up with rugs very quickly but this one I still love. It’s simple yet adds impact to a room. 8. Menu Synnes Chair – Alot of black, white and greys have been used, mix it up a little with some dark wood. 9. Georg Jensen Flora Vase – Teamed against the H&M vase. If I had a bigger space this would be the dream sofa. On a Saturday night, I could imagine us all sitting around watching a movie and being comfortable. It’s plump with filled seat cushions for you to sink back in and relax. You can pick from a great selection of fabrics or something in a two-toned weave could be lovely. 1. The Hepworth Collection from Atelier by Mintstudio – Simple print picking up tones of the cushions and rug. 2. Rectangular Suede Box – Experimenting with different textures. 4. White Marble Shelf – Marble and brass is one of my favourite materials. 5. Francesco Balzano Table – Strong statement side table. 7. Frama Circle Mirror – Again makes a room appear to be that it is, with the use of mirrors. 8. Velvet Cushion & Muuto Mingle Cushion – Cushions are a cheap and easy way to update a sofa. 9. Darlings of Chelsea Lucens Rug – Soft pink tome will marry well with the brass and marble materials. 10. Hay Wrinkled Blanket – It’s the same colour as the sofa but it’s a different texture. Now, this might be a chair but I think these would fit nicely together with a sofa. 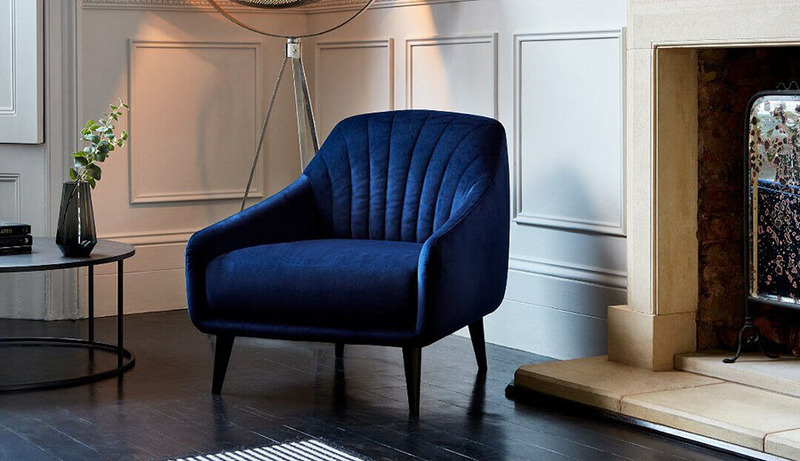 Instead of having two sofas you could have one and a pair of the Savoy chairs in this gorgeous velvet blue. I’ve always wanted a sofa in a brighter colour and in velvet. I just can’t commit in case I grow to dislike it in a couple of years. The Savoy chair has a deep back, which I am sure you would be comfortable sitting back in. Partnered with a sofa I think it would look the part. 1. Cap Table Lamp – Picking up the tones of the chair. You don’t want to go all blue but soft hints. 2. 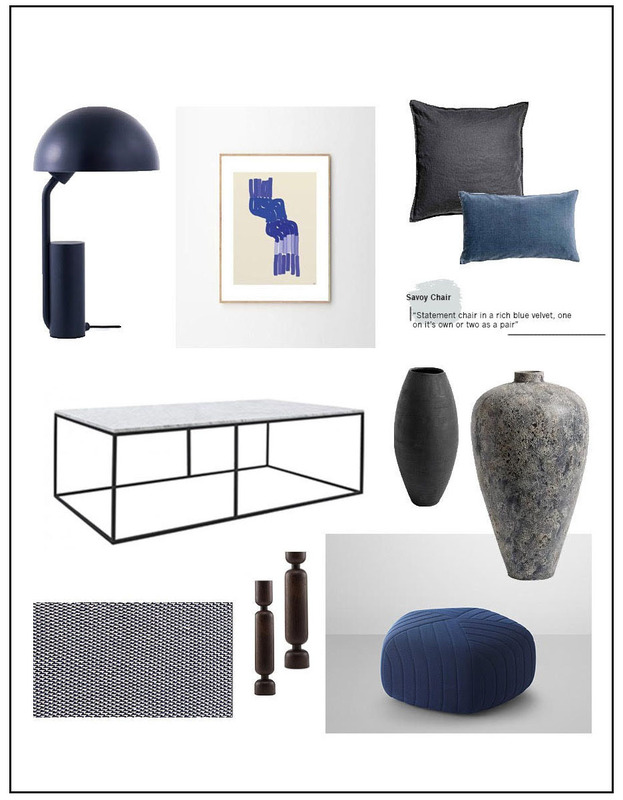 Lisa Wirenfelt Blue Shades Print – Stronger blue graphic print. You will have noticed all the prints that I have picked aren’t fussy. 3. Habitat Marble Nestor Coffee Table – Again with the marble my favourite material. 4. Muubs Vase – Statement vase, could sit on floor or coffee table to add some height. 6. Muuto Five Pouf Dark Blue – Cause we all like to stretch our legs out and get comfy. 7. Lumberjack Candle Holder – Candles are a must in a room, especially in the winter. Introducing some dark wood. 8. Darlings of Chelsea Two-Tone Rope Navy & Ivory – A lovely two-toned rug to tie the whole room together. Which is your favourite style above? If you are looking to invest in a new sofa be sure to look at the collection from Darlings of Chelsea. Good quality sofas that will appeal to everyone’s tastes, as there are so many different styles. If you are in the area they have four different showrooms across the UK in Birmingham, Surrey, St Albans and Fulham so you could go in and test some sofas out! This post was written in collaboration with Darlings of Chelsea, all thoughts and opinions are my own.